Smokey Maple Baked Beans (Vegan! 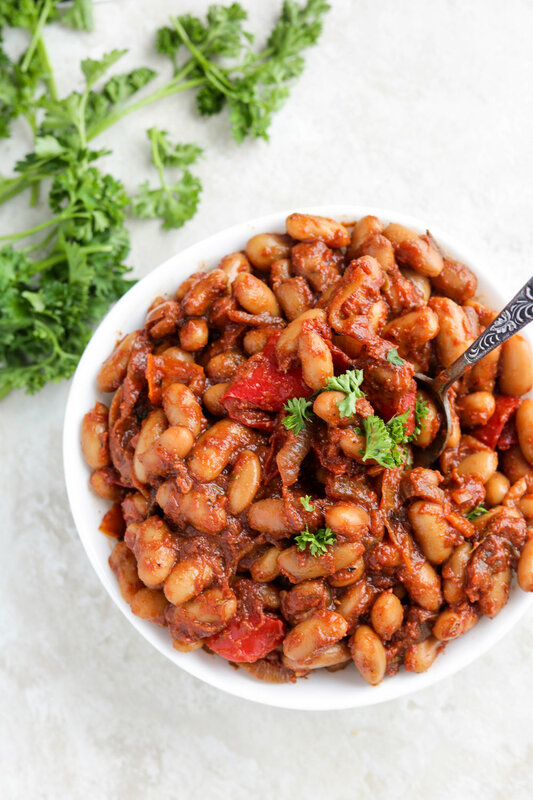 These Vegan Smokey Maple Baked Beans are naturally sweetened with pure Canadian maple syrup with a perfect balance of smokiness from the paprika. This dish is so easy to make and can be eaten for any meal alongside with crunchy toasty bread and on a bed of freshly streamed white rice. Packed with plant based protein, the versatility of this dish makes it perfect for weekly meal prep! Ever since becoming vegan, beans have hands down become my absolute favourite source of protein- I mean they can be made into anything and everything! Tofu and tempeh are both made out of beans AND you can make all sorts of snacks and desserts with beans like my crunchy maple dijon chickpeas or my high protein healthier cookie dough. Experimenting with beans is so much fun because they come in all different shapes, sizes, textures and flavours. Personally, I can eat beans just like that, maybe with a little drizzle of sriracha… mmm. I felt a little adventurous with my beans one day and started thinking about flavour combinations that I love: smokey, sweet and a little spicy. I recently purchased some smoked paprika and saw a little bottle of maple syrup on the counter top beside me. Perfect. That’s how I usually brain storm most of my recipes. I see a couple ingredients, use that as my base and ten go from there. In total, it took me 3 tries to really nail this sauce so I promise- if you make this recipe you won’t be disappointed! It’s perfect for meal prep. For me, this recipe makes 4 servings and keep well in the fridge or freezer. When reheated, it tastes just as good (if not better). It’s versatile. I love to eat this over a bed of rice, some toast, mixed veggies, baked potatoes, pasta- really any grain of your choice. You can use any beans of your choice! I used white kidney beans but pinto beans, red kidney beans, black eyed beans and cannellini beans beans work great as well. It’s packed with plant based protein, low in fat, satiating and really easy to make. If you make this dish, please share it and let me know what you think by tagging me on Instagram @lisakitahara, I love seeing all of your tasty recreations!